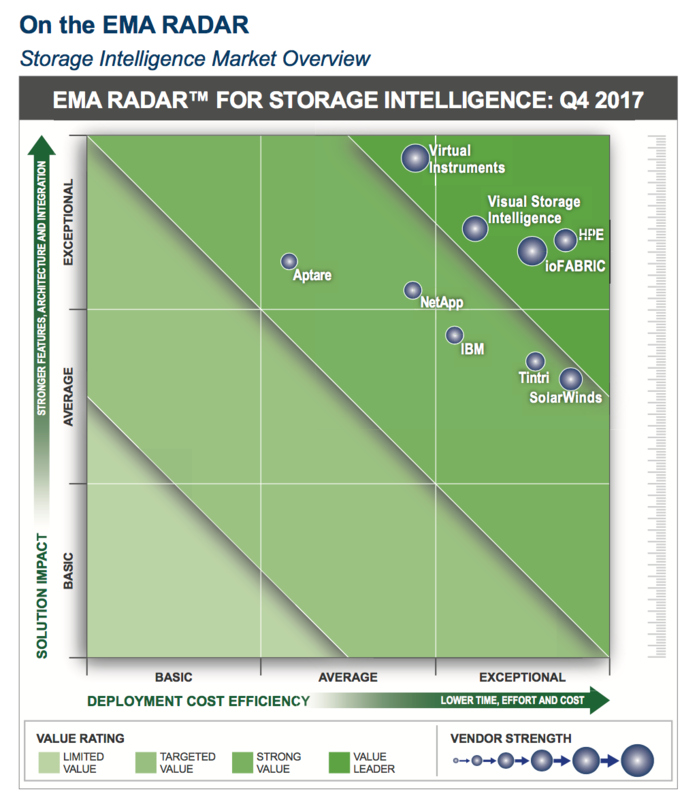 Visual Storage Intelligence®, a leading storage analytics software company, announced that it has been recognized as an industry “Value Leader” and “Best Capacity Management” solution by Enterprise Management Associates (EMA) in their 2017 Storage Intelligence Radar Report. Recognition as a “Value Leader” is the highest award level bestowed by EMA. EMA is a prominent IT and data management research and consulting firm. The EMA Radar Report, developed by Steve Brasen, Research Director – Systems and Storage Management, is an annual comparative evaluation of leading vendors in the storage intelligence space. This year nine vendors were included in the study, including three very large “legacy vendors”. EMA defines “value” as the ratio between the strength of a product set against its cost efficiency. In the chart below, EMA ranks Visual Storage Intelligence® as the storage intelligence leader in terms of ease of use, architecture, and integration. Visual Storage Intelligence® also stands among the top in terms of cost-efficiency, offering time, effort, and cost advantages to its storage intelligence customers. “It is truly a great honor for us to be recognized by EMA as a Value Leader in the storage field,” said Phil Godwin, President of Visual Storage Intelligence®. “We want Visual Storage Intelligence® to be simple to use, easy to understand, and provide the actionable intelligence that customer’s find valuable. This award is validation that we did just that.” We are excited and honored to be given this award. If you would like to download the report for free click the download button!